This model is badged as economic which at first put me off because it suggested this was a cut down cheapo version of Recordâ€™s existing range. I'm glad to say, however, that I need not have worried. 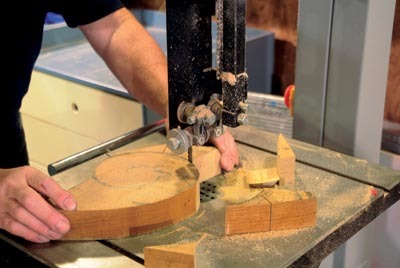 This bandsaw seems to incorporate all the lessons Record have learned in bandsaw development over the years, indeed improving on their earlier models without producing a less desirable product. I tried the standard wheel kit and quickly gave up on moving it around much, but this might suit the woodcarver who likes to permanently site a bandsaw. With the wheels fitted, a child can pull it around so it could become something of a safety issue! There is quite a bit of assembly with the base, the table and fence etc. The manual gives advice on setting everything; an engineer's square is needed for getting the table true and adjusting the fence. The table front face is ground to give a reference surface. The bandsaw case is very rigid indeed and the cast-iron table very solid, ground smooth and about as flat as you could reasonably expect. 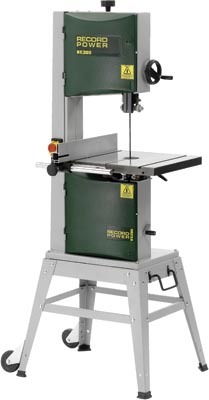 The case doors are microswitched for safety, and blade changing is made easy by loosening off the tension. There is no quick release on this model, I'm afraid. However, the blade was so tight I had to tilt the upper wheel to get it to go slack enough to remove. As tracking can be done manually, this isn't a big issue when mounting a new blade and resetting tilt and tension. The motor and two-stage pulley deliver plenty of power â€“ pulley tension can be adjusted by a lever on the lower case. The blade supplied was a 10mm x 4tpi skip tooth, which is fast cutting and ideal for deep blanks, but gives a coarse striping cut. The guides are reassuringly heavy-duty and stay put under pressure, with guide rollers above and below the table. There is plenty of adjustment on all of them. I like this machine and was impressed with the way it performed. It is compact but heavy and rigid, and cuts well. It is definitely one to consider putting on the wish list!